A CabWriter user wrote and asked how to integrate three cabinets into one cabinet, at least in appearance. As shown below the center cabinet consists of three boxes: from left to right a Standard Base w/Drawer, a Drawer Bank Combo with 4 drawers and another Standard Base w/ Drawer. The other two cabinets, one on each end, are Divided Base one box cabinets. They are designed for wine bottle storage. Three Separate Cabinets – A 3-Box Cabinet Sandwiched By Two Wine Cabinets. If you look at the two large ellipses at the top you will notice a 1 ½” gap between each Divided Base box and the Standard Base w/Drawer box next to it. I think the assumption the user made here is that adjacent cabinets must stop and start at the same point so that they avoid overlapping. In fact it is often useful for two cabinets to overlap their End Connector Stile(s). This of course means that two stiles occupy the same space but that is easily remedied by deleting one of them. 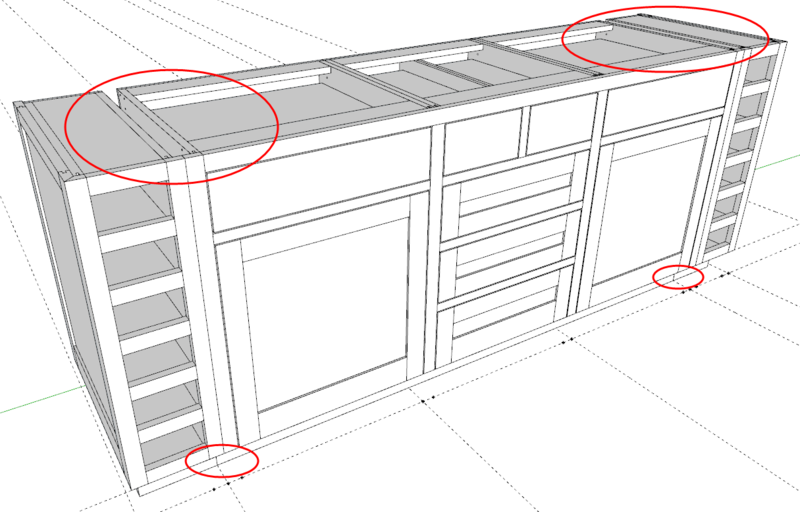 Had these cabinets been drawn that way from the start all of the changes involving the Edit Story Stick tool shown in the video could be avoided. Deleting redundant stiles, editing the top rails and integrating the ladder base would still be necessary. 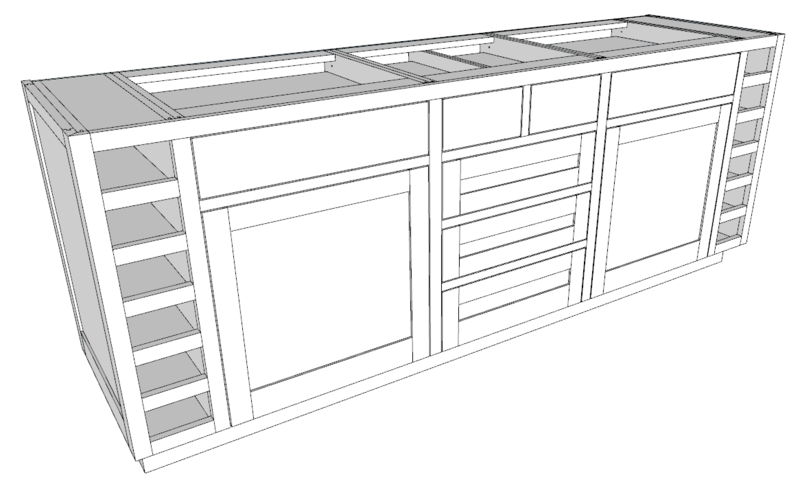 But that is the approach I would take if drawing these cabinets from the start. Change the type of stile used at either end of the cabinet. The stiles between the end stiles are always a variant of a connector stile and cannot be changed. Move the position of any number of stiles that make up the cabinet right or left a specified distance. This includes connector stiles. Each stile can be moved a different direction and distance. This is useful to widen or narrow a cabinet and/or boxes within a cabinet. Move all stiles collectively forward or back, hence shifting the whole cabinet forward or back. In this video I will demonstrate all three of these operations. The second operation above will be used to ‘fix’ the problem the user inquired about. Closing the two 1 ½” gaps means that we will pick up a total of three inches in storage. The question is how to distribute that increase; this is a choice for the designer and/or client. But I am going to assume that the wine storage is the width that should stay fixed and three inches should be distributed equally among the middle three boxes. That means editing the middle cabinet and moving its Left End Connector Stile 1 ½” to the left, moving the next Connector Stile ½” to the left, moving the next Connector Stile ½” to the right and finally moving the Right End Connector Stile 1 ½” to the right. This will all be done with the Edit Story Stick tool. Next I will use native SketchUp tools to edit the ladder bases into one structure. Finally I will edit the top rails and two End Connector Stiles to form a one cabinet integrated look with one top rail. See the final design below. The Final Design Is a Single Cabinet Look and One Ladder Base Structure. I distributed the 3” additional space equally. I did that to show you how to change all four stiles differently. If I were doing this for real I would have added the entire 3” to the Drawer Bank Combo box because aesthetically the combo drawers would look better. To do this, from left to right, I would have moved the first two stiles 1 ½” to the left and the last two stiles 1 ½” to the right. However there is no right distribution, only a designer/client choice. But realize there are numerous options available. Now, get some chips or nachos and enjoy the feature film.